Black Panasonic NN-SB458S is a compact 0.9 cubic feet capacity modern microwave oven with a decent 900 watt high power motor for home use by singles and families. As a hot new release microwave it is rated 4.3 out of 5 stars by 7 customers, which is quite a reasonable score. Panasonic 0.9 cu. ft. Microwave has a sleek black exterior, weighs 34 pounds and measures 19.1 x 14.8 x 11.5 inches with less space for electronics components and more interior space. You can easily fit a baking dish that measures 9 x 9 inches on the 10.6” turntable. As a compact, slim and lightweight unit it will save you on counter space but is spacious inside with a 0.9 cubic feet capacity. 900 watts of power means it will heat up, defrost or cook your meals faster and evenly as you select one of the ten power levels. It is designed to offer you tasty and healthy results with most of the nutrients and flavors kept in your meal. You have the “Keep Warm” feature that helps keep main meals, soups, veggies, desserts, sauces, gravies tasty and warm till they are ready to be served, “Popcorn” option with three power levels, “Auto Defrost”, “Child Security Lock” and more on this great little microwave oven. You can press the “Quick 30” button for a quick 30 seconds of heating on this microwave, as well as the “More” and “Less” options. As microwave controls, there are 7 preset “Auto Cook” options for different menu items, “Auto Reheat”, “Serving/Weight”, “Cooking Timer” and “Clock Set” buttons. These 7 auto-cook menu items are for pizza, dinner plates, beverages, frozen entrees, fresh veggies, frozen veggies and potatoes. The three power level options for the Microwave Popcorn is for different sizes of the microwave popcorn bags. So you have the best results every single time- consistently. With the non-inverter LC power supply it ensures even cooking most of the time. 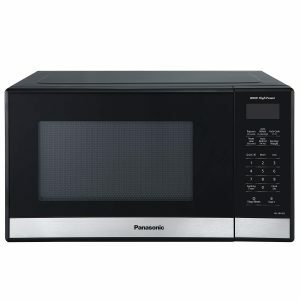 Panasonic Microwave has a modern and stylish appearance and will look nice in any kitchen decor. It will not look out of place no matter what color is dominant in your kitchen. The large rectangular silver button at the bottom right, underneath the control panel is the door release button. It is a decent quality microwave oven that runs quietly and gets the job done well- quick and relatively even heating and cooking. The interior is easy to clean as you can easily remove the 10.6-inch size turntable and wipe it properly. To use the 30 sec. function you need to press the Quick 30, then the Start button. And there is an interior light that turns on not when the door is opened but when the microwave is on. The large display at the front is quite bright and may glow in the dark like a nightlight if it is in your bedroom / dorm room. Please also note that this is not a sensor type microwave that automatically sets the time based on the steam released by the food. 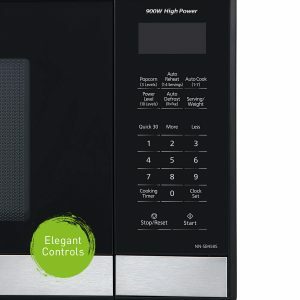 But you can’t really expect this feature at such low price point and given that this microwave looks great, does quite a good job- quietly, quickly and efficiently and is built with good quality materials. And as an Energy Star rated microwave oven it will not use up much electricity and will save you on your energy bills. Panasonic is a company that promotes healthier living and eating, being inspired by the Japanese culture of cooking tasty and healthy meals by their great quality touchpad kitchen appliances.